This time last year it was me out there running Marathon Des Sables (check out my story here) but this year it was up to hubby, Dion Leonard, to go and run the ‘Marathon of the Sands’ again whilst I sat back and watched, and watched and watched! There wasn’t a minute that went by that I wasn’t either thinking about MdS, talking about it to someone, tracking Dion and other runners I know on the live tracking system and ultimately glued to the webcam to watch them cross the line each stage. There wasn’t much work getting done all week with the webcam on constant refresh and I could feel the tingling of nerves everyday when the race would be starting. Having been through MdS myself I could at least understand the all encompassing preparations that takeover everyday existence in the lead up to the race so I could lend an ear for more discussions on calorie per gram and whether the 20g of wine gums was too much to carry for a treat without getting to frustrated. I can appreciate for non running partners of other MdS runners this must be quite alien and frustrating to deal with. The house for the 2 weeks before Dion departed was strewn with kit, and food bags meticulously weighed and labelled, being check, double and triple checked. 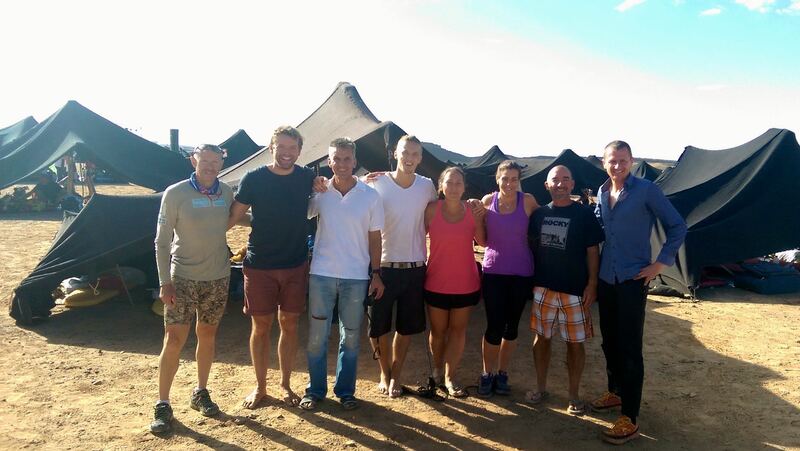 The preparations had started the year before though, as soon as we were back from MdS 2014, Dion was training for this race. His dedication and consistency was inspiring to watch, and seeing the hard work he put in through the cold winter months and the excruciating heat chamber sessions he went through in not only our homemade heat chamber but also the one at Edinburgh Napier University, I knew he meant business and results were bound to come. 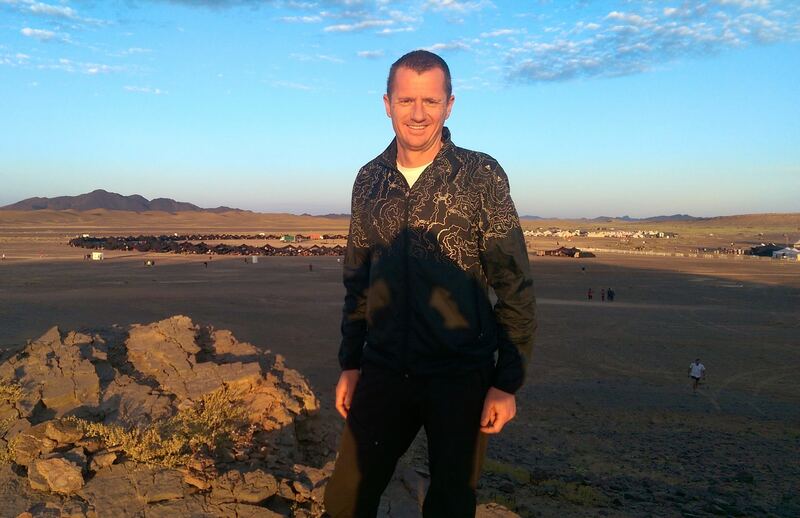 And then he was gone, in a whirlwind of pre-race excitement, Dion was off to Morocco…..without me! It was the first time we have had separate ‘holidays’ and done a race separately so it was strange to see him go, and I have to be honest and say I was definitely feeling jealous and wishing I was going too. I had a good selection of plans to make sure I was kept busy whilst he was away, kick starting with a weekend in Holland visiting my family (and stocking up my Dutch cheese supplies of course), though I must have drove my Aunty and Uncle crazy making them watch a documentary on a Dutch presenter, TomTesterom, that did MdS in 2013. Combined with my regular updates of Dion would be having his last meal served to him now, waking up now putting his pack on, race starting etc it might have been a bit much for non runners to deal with. The night before the race started I couldn’t sleep myself, I was worrying about Dion in the tent, wondering how he was feeling, how my other friends were feeling and I felt as nervous as if it were me out there about to race the next day. I flew out of Holland whilst Stage 1 was underway but was back on the live tracker as soon as the plane hit the tarmac again in Edinburgh. The week was busy enough with work and my own training in between following the race constantly, but unwinded from all the excitement while Dion was running the last stage, the charity stage, by heading to The Lakes for my race recce for the 110km Ultimate Trails race I am doing in June, so 36 miles of brutal climbing certainly sorted me out! It was certainly exciting following the stages, especially having a loved one in amongst it, made all the more real with the live tracking system introduced this year which meant you could literally follow any runner live and ensure you were then at the ready for their appearance over the finish line for the webcam. It is all encompassing though, my life revolved around the race even though I wasn’t there, and being Dion’s PR machine for the week I was busy keeping his twitter and my Facebook updated. But my obsession didn’t end there, I was following loads of friends out there running and couldn’t tear myself away from the webcam until I knew they were safely across the line. The most moving of all was seeing friend, and last years tent mate Cheryl finishing the MdS as the last runner (she didn’t finish last year so this was even more poignant). For the long stage I arranged a night out with a friend I had made at last years MdS, Helen, and we pitched up a table at our local Italian, Taste of Italy set ourselves up complete with the laptop on the table, food taking 2nd place to webcam viewing. We were excited, the other diners must have been wondering what on earth we were watching as we shrieked and clapped as people crossed the line. Even after Dion had come over we were still glued to the screen ‘look there’s another one’ ‘who’s that?’. It was an exciting evening of viewing. The next day, which was rest day for those like Dion that had already finished the long stage, however some of my friends were still out there so I didn’t get a rest day, the excitement continued, I even missed my running club that evening as I had to stay and watch Genis & Tanya Pieterse our South African friends finish. Can you spot Dion in the front line ready to take the lead on the long stage? 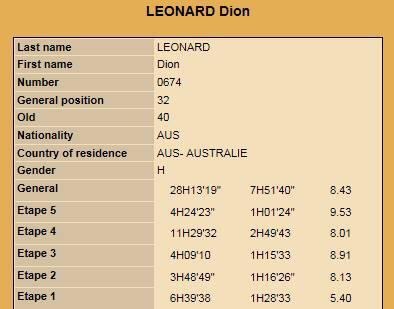 Dion had a fantastic race which made it all the more exciting as well to see how he was placing, he had gone back with high goals which he well and truly smashed! 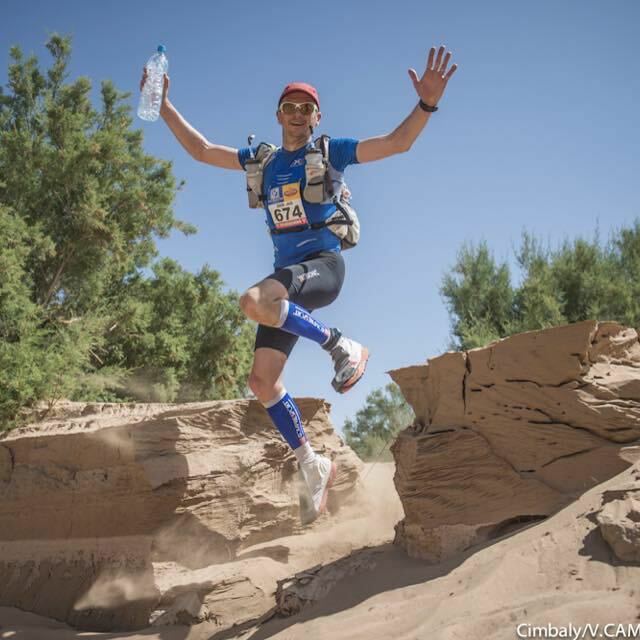 Stage 1 he finished in 79th, stage 2 in 48th, stage 3 49th (putting him into 63rd overall) and then an amazing stage 4 which was the longest stage in the history of MdS with 91.7km crossing the line 3rd in 11hr 29min although in 23rd for the stage (the top 50 runners start 3hrs later) which put him in 32nd for the overall rankings. At one point he was leading the race! I was so excited for him, at that stage I was jumping out of my chair at work and couldn’t sit still, I had Marina on Whatsapp constantly and Princess Peter on Facebook messenger non stop as we were both glued minute by minute to the race. Stage 5 he finished in 57th but kept his placing overall at 32nd. An absolutely stellar result! 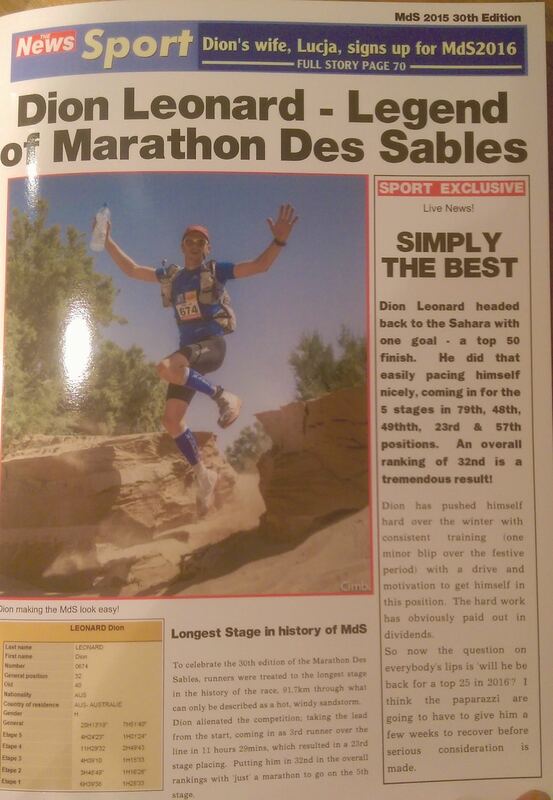 It was hard going watching and not being there it actually physically hurt so bad that I wasn’t there amongst it, so hard I had registered and paid my deposit for MdS 2016 before Dion had even got back! (And in all the excitement building up I also convinced Marina to sign up as well #TeamLuRi for MdS 2016). The beauty of Dion having done so well means I now have a live in personal trainer to get me ready for next year! Next stop for me however is Transvulcania in 3 weeks on 9th May, 73.3km with 8,500m of ascent on the beautiful island of La Palma. What was the highlight/best bit of your week running the MdS? Impossible to highlight one but the whole experience from start to finish is second to none, the morning start line blast of “Highway to Hell” gets you pumped up no matter how tired you are, sharing time with some amazing people, running in a brutal but beautiful country, seeing your tent mates coming in every day and what they’ve gone through & their own achievements and of course finishing 32nd for myself. What advice would you give a runner looking to compete at MdS themselves? Train hard, be organised and confident with the kit you take, get there and enjoy the race and results will follow. Don’t be overcome by all the hype! What, if anything, would you change in your kit/food that you took? I try and take 4/4.5kg of food and make up the other 1.5kg with minimal kit, at times on a rocky campsite a mattress would have been nice. Other desert races to run in 2016 but I’d like to go back in 2017 and see if I could finish in the top 20. West Highland Way in June which is a 95 mile race in Scotland, North Face Cappadocia 110km in October in Turkey and a bit undecided for 2016 except a definite will be Atacama and Mohican 100 miles in the States.